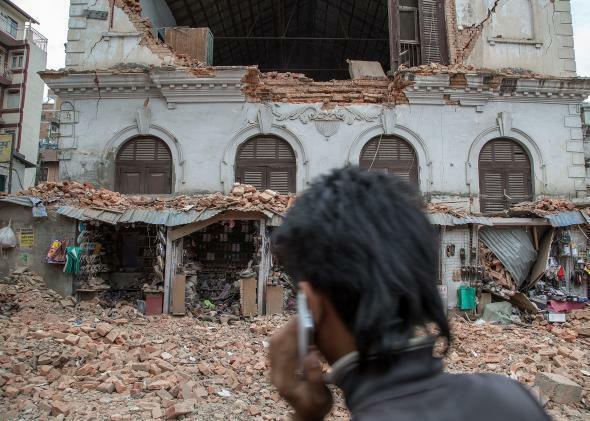 After Nepal earthquake, Facebook and Google offer safety check-in features. A man speaks on the phone in front of a collapsed building in Kathmandu on April 25, 2015. Google and Facebook both offer check-in tools for large-scale disasters so users can indicate whether they and others are safe. And people in Nepal have been using both in the wake of a 7.8-magnitude earthquake that hit the country early Saturday morning. With the death toll above 1,000, and rescuers frantically trying to free people trapped in rubble, those who are safe or abroad have been getting information from these services. Google engineers began working on the Person Finder feature after the January 2010 earthquake in Haiti. Google.org (the company’s charitable division) has since expanded its functionality, and deployed it during crises like the 2013 Boston Marathon bombing. Meanwhile, Facebook’s Safety Check, which launched in October, sends notifications to users who may be in a crisis area asking them “Are you safe?” Users can post “I’m safe” or “I’m not in the area,” and can also indicate that other people they are with are safe. The usefulness and even importance of these types of services is obvious, but the major problem with them is that people can post about their safety only if they have connectivity and an Internet-enabled device. If someone’s smartphone is smashed in a collapsed building, or a natural disaster knocks out telecom systems in an area, it may be impossible to send a digital update. This was an issue during large-scale floods in Pakistan during 2010, when Google attempted to deploy Person Finder, mostly unsuccessfully. UNICEF reported Saturday that cellphone networks and power were out in many parts of Nepal. Anecdotally, a Nepalese business owner in Harlem, New York, told Slate that he had been receiving some updates through social media from friends and family in Kathmandu, but that many people he knew were in areas that had lost connection.